Copies track as extra pages instead of copies. Copy count is always 1, even when multiple pages are calculated. But the total pages report is correct. To work around this issue, the driver and/or application will create a job with only 1 copy, but duplicate the documents contents causing multiple sets to be printed. This may only occur from certain applications, or all applications depending on how that application is specifying copies. Print to a driver with this issue, and select only 1 copy. This example will show in detail what is occuring when a driver has this issue. 3. We Open the Print Dialog, and initially only print it with 1 Copy. 4. 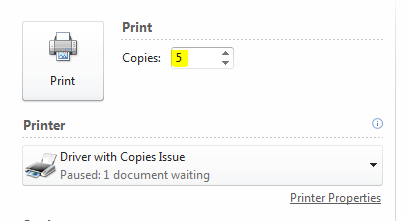 We Open the Print Dialog again, and this time print it with 5 copies. The file size is roughly 5 times that of the document with 1 copy. This helps indicate that rather than telling the printer to print 5 copies, it actually created a file with the contents copied 5 times. The pages here show 5 in both caes. However the Print Manager Plus Advanced Counting Engine is able to determine the actual Total Pages even when the copies command is not used. We can look closer at each print job in queue by double clicking on it. If we do so and examine the Copy Count we can see the job again was only submitted with 1 copy. Even though mutiple copies was selected. The Print Manager Plus counting engine is designed to track what is sent to the printer, and does not intervene with the client side, or printer dialogs. Since in this case 25 Pages are sent to the printer with 1 copy, that is exactly how the job will be tracked. Most cases reported have been resolved by either upgrading drivers, or switching to other drivers. For example changing to a PostScript driver when a PCL driver was being used. 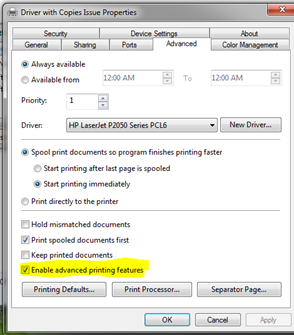 Printer drivers are more prone to this issue when the print queue setting Enable Advanced Printing Features is disabled. It is recommended that this be activated. Print Manager is working on the issue, and in finding any hint to help indicate that the document is being sent in this manner and to try and determine the copies selected. Future versions may be able to determine the copy count selected on some devices.